Early speculation regarding our family’s Jordan ancestors from Mexico was that they originated with an Irish or English immigrant. However, research has led us to discover that the surname is rather widespread in both Mexico and Spain. Several sources suggest that the name comes from Spanish, English, and French crusaders who fought in Jerusalem, were baptized in the River Jordan, and later assumed the last name Jordan. Our branch of the Jordan family first arrived in Las Cruces, New Mexico Territory in the early 1860s from from the farming community of Jimenez, Chihuahua where three prior generations of Jordans had resided. Our first Jordan was a soldier who likely arrived in Mexico in the 1760s from the town of Lorca in the autonomous community of Murcia in Spain. It is possible he landed at Veracruz before eventually settling in Jimenez (formerly known as Huejoquilla) located in the extreme southeastern part of Chihuahua state. The presidio of Huejoquilla was established as a military garrison in 1753. For now we can trace our line back three generations beyond the New World Progenitor (First Generation below) to Augustin Jordan in Spain. He was from Vélez-Rubio, Almería in the autonomous community of Andalucia and married to Ana Romero. We only know their names from the marital record of their son, Bernabe Jordan de Romero. Bernabe married Juana Oliver in Lorca, Murcia on November 10, 1688. 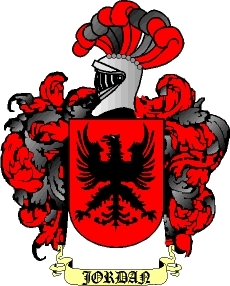 They had at least one son, named Bartolome Jordan de Oliver. 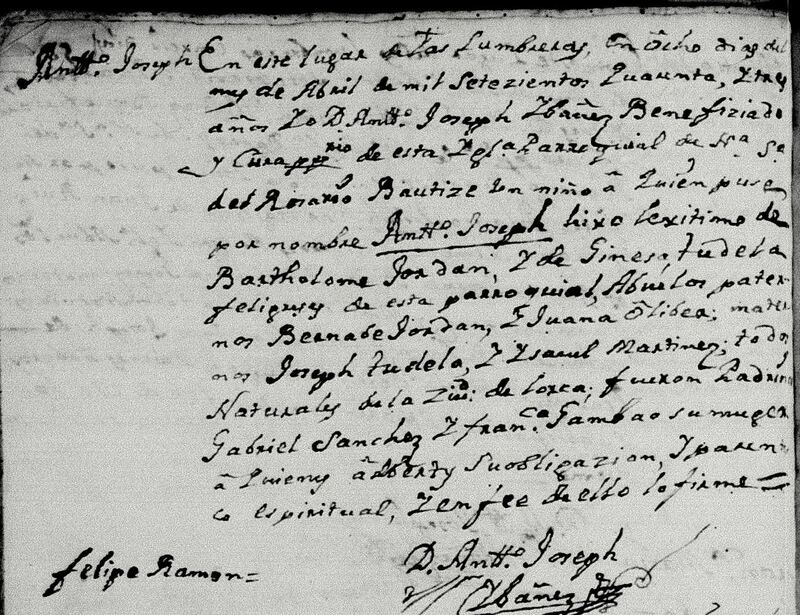 He married Gisena de Tudela on August 10, 1722 in Lorca, and had a son named Jose Antonio Jordan de Tudela. 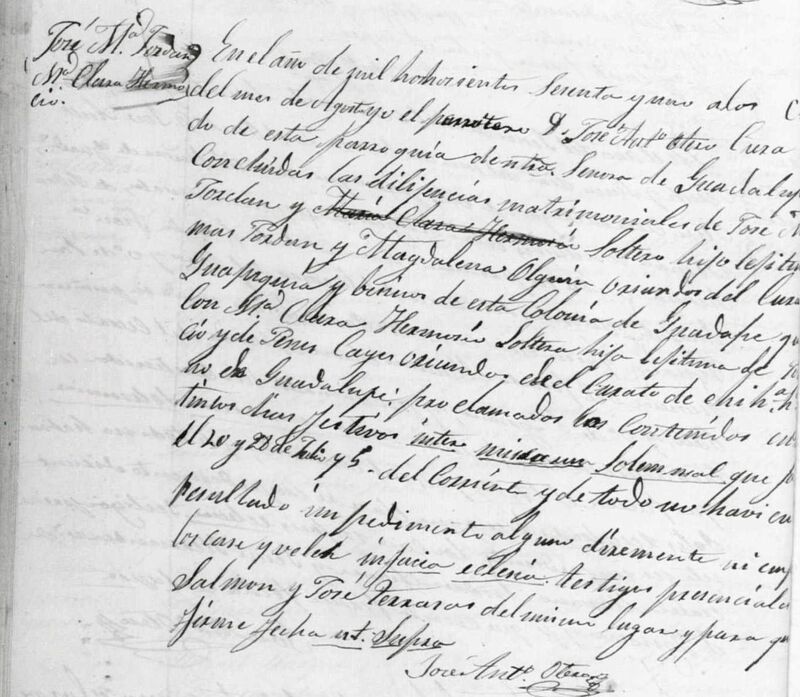 The marriage records noted above come from the parish records of the San Patricio Church. 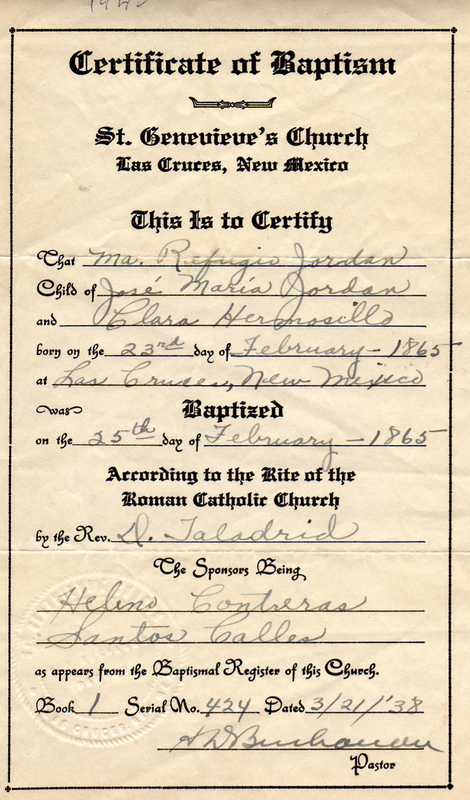 With the exception of Antonio’s birth record, all information below comes from records obtained from the Santo Cristo de Burgos Church in Jimenez, Chihuahua. Succeeding generations are below starting with generation one in the New World. Direct line ancestors are highlighted in blue. Antonio was born in Lorca in Southeastern Spain, in April 1743. He was baptized at the Nuestra Senora del Rosario church in nearby Puerto Lumbreras (while baptized in Lumbreras, the record notes that the family were ‘naturales’ de Lorca). We know almost nothing about his early life, although he is certainly the first immigrant of this line to arrive in the New World. 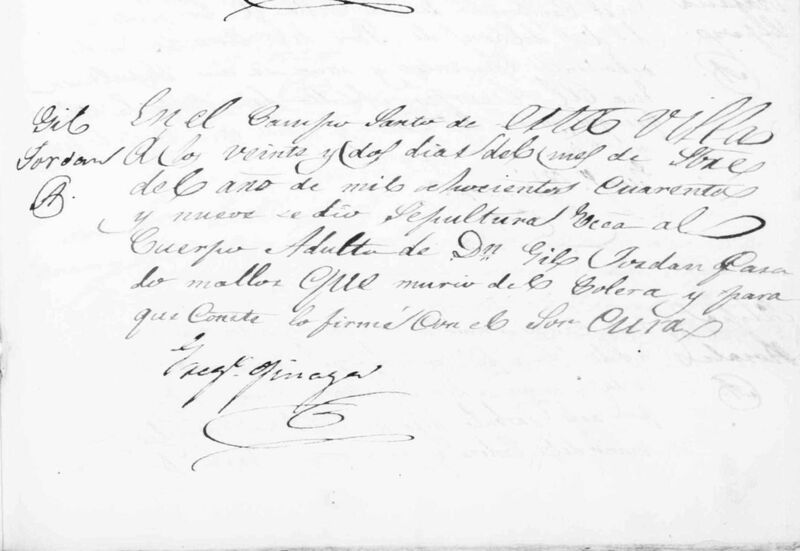 According to this marriage record, he was a solider in the Regimiento de Dragones de España (Spanish Dragoons Regiment). 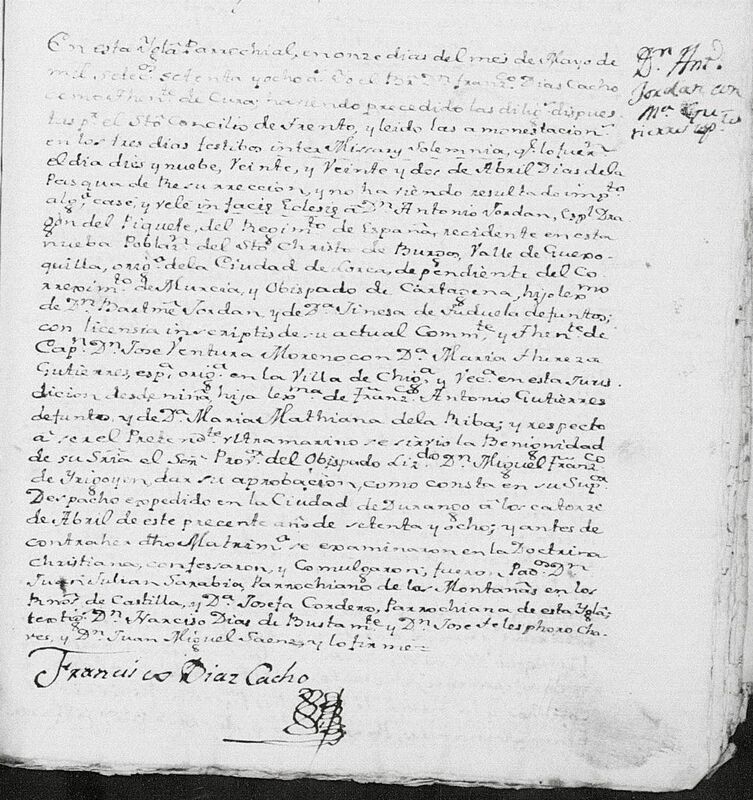 According to Spanish colonial records, the regiment was formed in the port city of Veracruz on the Gulf of Mexico in 1764 from mainland Spaniards to compose eight companies. The Viceroy of New Spain sent the Spanish Dragoons to pacify Sonora in 1767, and some units were even used to help expel the Jesuits from Mexico. We can assume that one of the eight companies in the Regiment was eventually assigned to the Real Presidio de Santa Maria de las Caldas del Valle de Huejoquilla (present-day Jimenez in Chihuahua State). Huejoquilla was an important military garrison on the Camino Real in the mid-late 1700s. 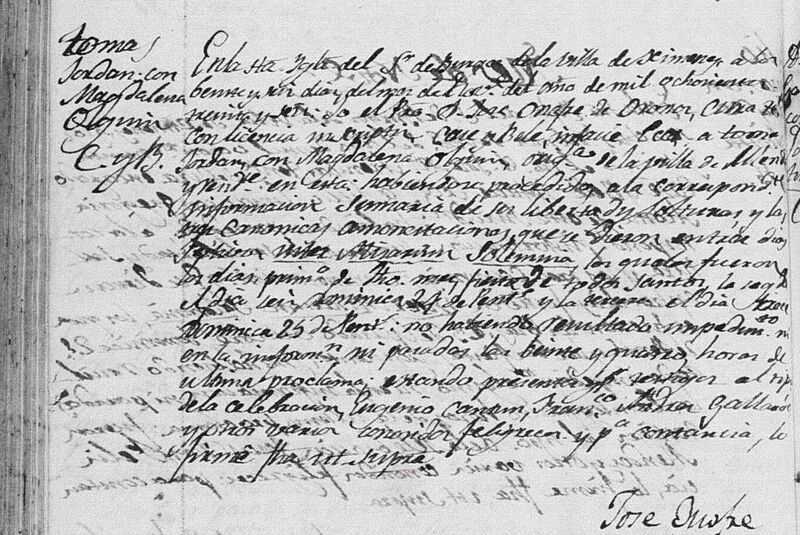 Antonio married Maria Teresa Calixtra Gutierrez Riva in Jimenez, Chihuahua on May 11, 1778. Teresa’s father, Francisco Antonio Gutierrez, was a soldier attached to the Presidio and an original settler in Huejoquilla after its founding in 1753. 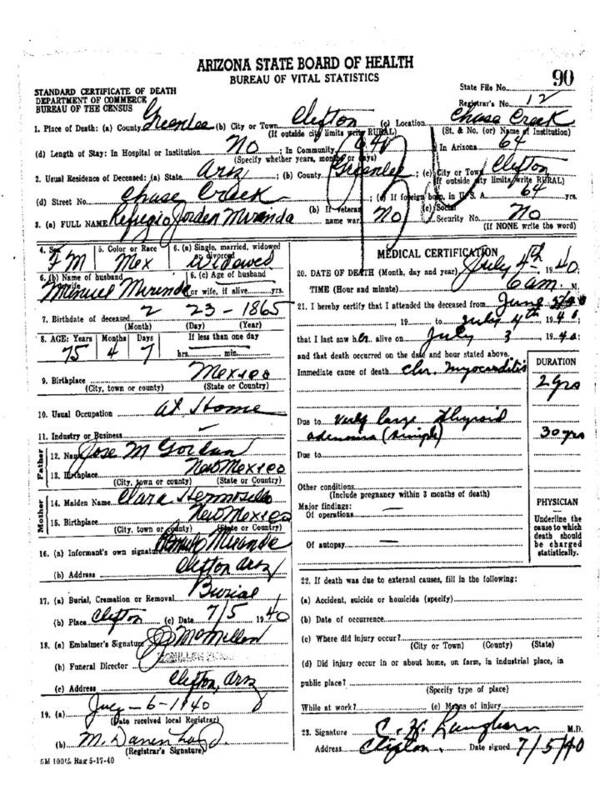 The Jordan-Gutierrez wedding record below gives detailed information regarding where the bride and groom were from as well as their parents’s names. Jose Antonio Ysidro, born April 1, 1803 in Jimenez. As noted in more detail below, we are certain that Antonio and Teresa are the parents of Gil as a result of a baptismal record for several of Gil’s children, which cite Antonio and Teresa as the paternal grandparents. Antonio died in Jimenez on May 31, 1804. The death record at left notes that he was European and married to Teresa Gutierrez. The record is difficult to read, but it does not appear to list a cause of death and does not list his age. 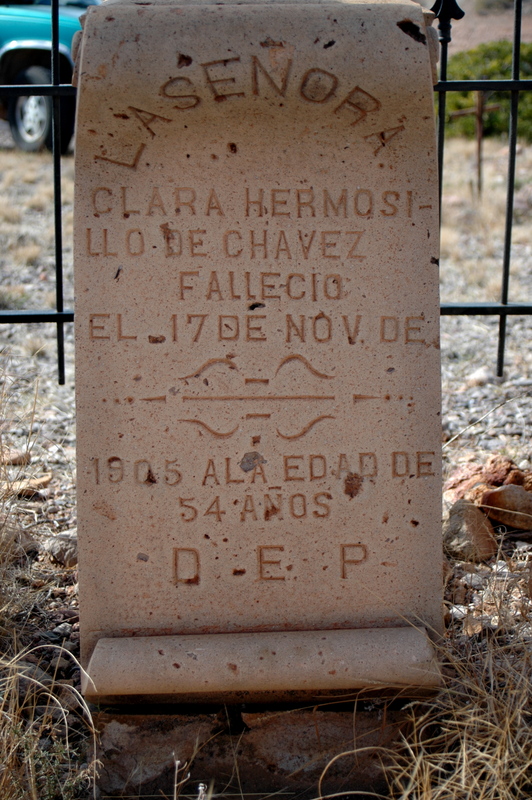 Teresa lived for another 40+ years – she died on June 22, 1847 in Jimenez. Antonio Simon Encarnacion, born March 26, 1814 in Jimenez, died December 1, 1815 in Jimenez. Tomas, born unknown in Jimenez and married Maria Magdalena Anna Holguin Munos. Jose Dionicio, born April 14, 1836 in Jimenez. Gil died on September 22, 1849 during a widespread cholera epidemic that swept through Northern Mexico that year (and also claimed the life of his grandson just a day later). The death record does not give any additional information, such as his spouse, how many children he left behind, or his age at the time of death. Tomas was born around 1810, although a baptismal record has yet to be located. He married Magdalena Holguin on November 26, 1836 at the Santo Cristo de Burgos church in Jimenez. 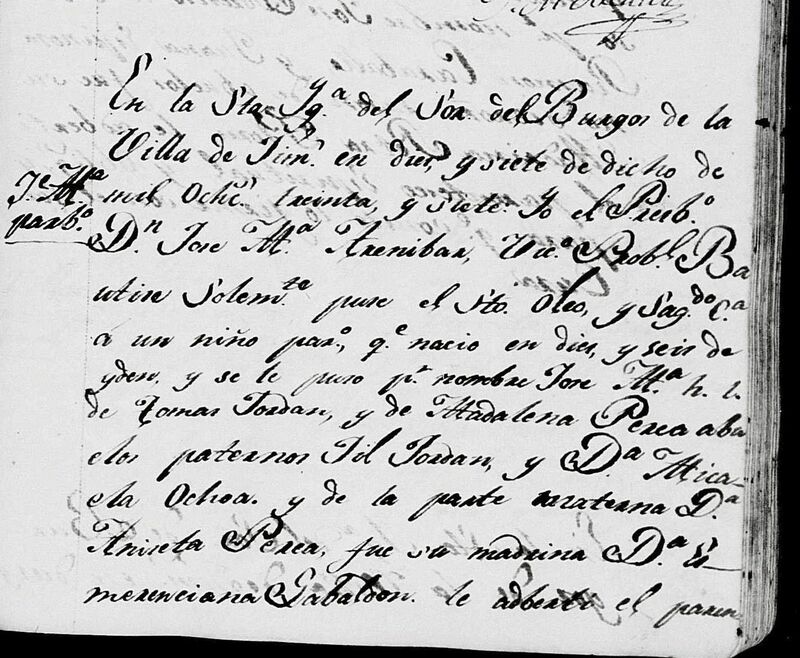 The church record is of poor quality, but the names are clear as is the date of the marriage and the priest performing the ceremony: Father Jose Onofre. The witnesses of the couple were Eugenio (last name illegible) and Francisco Jordan (possibly a relative). Although the record does not provide the names of the parents of the groom, we know Tomas’s parents names because they are listed on the birth records of his two children. Jose de Jesus, born January 18, 1839 in Jimenez, died September 23, 1849 in Jimenez (of cholera). Magdalena died on June 16, 1840 in Jimenez. Her death record does not specify the cause of death – she was only 20 years old. Her death came only seven month after the birth of her second child. Tomas married twice more. His second marriage was to Josefa Rodrigues, although a record has not been located. His third marriage was to Margarita Lechuga on April 26, 1855 in San Antonio de la Ramada, Chihuahua. 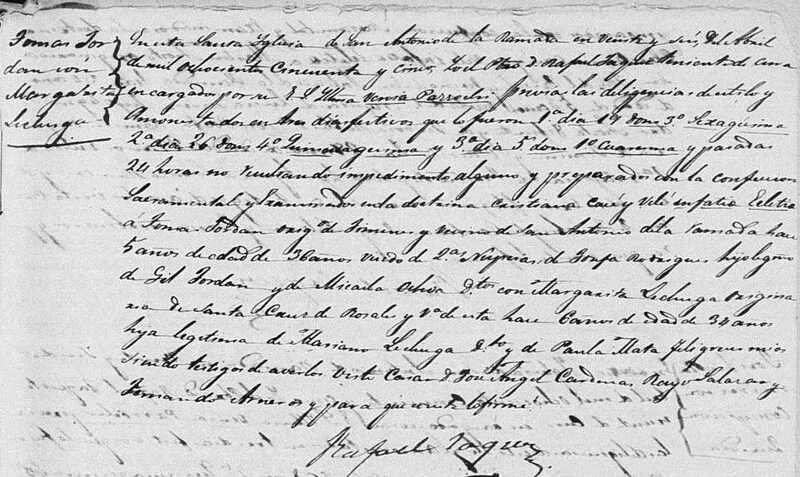 The record notes that Tomas had been twice widowed, that he was originally from Jimenez, and that he had lived in San Antonio de la Ramada (just outside of Ciudad Camargo) for the five years prior to his marriage to Margarita. The record also confirms that he was a son of the legitimate marriage of Gil Jordan and Micaela Ochoa. It appears that Tomas and Margarita had at least one child together as a civil marriage record exists from 1887 in Camargo for a Leonides Jordan, listing them as Leonides’s parents. A death record has not yet been located for Tomas, although he died between the 1887 marriage of his daughter and the 1895 death of his wife Margarita (the latter of which was noted as a widow of Tomas on her civil death record). Jose Maria was the first Jordan of our line to immigrate from Mexico to the United States and is likely one of the earliest of any branch in our direct line from Mexico to settle permanently in the United States. He was born on August 16, 1837 in Jimenez. Following the death of his mother while he was still only two years old, he was raised by his father. On August 14, 1861 he married Clara Hermosillo in Guadalupe Bravos, Chihuahua. Clara’s family was from Chihuahua City. It is not clear where the couple met, but is interesting that they married in a small town where neither appears to have had family. Guadalupe Bravos is on the border with Texas and was likely the launching point for the couple’s eventual move to the United States. It is likely they arrived in New Mexico Territory in either 1862 or early 1863, during the U.S. Civil War. Ana Maria, born April 17, 1863 in Las Cruces, New Mexico Territory, died before 1870. Juana, born April 17, 1863 in Las Cruces, New Mexico Territory, died before 1870. Maria Refugio, born February 23, 1865 in Las Cruces, New Mexico Territory, married Manuel Miranda. Maria Ysabel, born in November 4, 1868 in Mesilla, New Mexico Territory, died before 1870. Jose Maria and his family were certainly some of the earliest settlers of Las Cruces, New Mexico Territory. They appear in the 1870 U.S. census in Las Cruces, where Jose Maria’s profession is listed as “laborer.” While today, Las Cruces is the second largest city in New Mexico, at that time it was a small village with a population of some 1,500 and secondary in Dona Ana County to the larger town of Mesilla, just to the West. As such, Jose Maria was a pioneer of Las Cruces, a city which later became an important trading post following the construction of an east-west railroad linking El Paso, Texas to the Pacific Ocean. Jose Maria was also undoubtedly a pioneer of Arizona Territory and particularly the town of Clifton, first appearing in the Great Register of Arizona in October 1876, living in Clifton (which was then under the jurisdiction of Yavapai County – one of the original four counties created by the First Arizona Territorial Legislature in 1864). The register notes that Jose Maria was from Chihuahua and that he had naturalized as a U.S. citizen in November 1873 in Doña Ana County, New Mexico Territory. He is also listed in the June 1878 Great Register of Arizona, again residing in Clifton. Most likely, he was either directly or indirectly involved in mining as Clifton in the 1870s was only beginning to realize its potential as a sustainable copper mining town in the early years of its existence. Clara and Refugio must certainly have remained behind in Las Cruces during this time, since Clifton was still nothing more than a tent city in the 1870s. 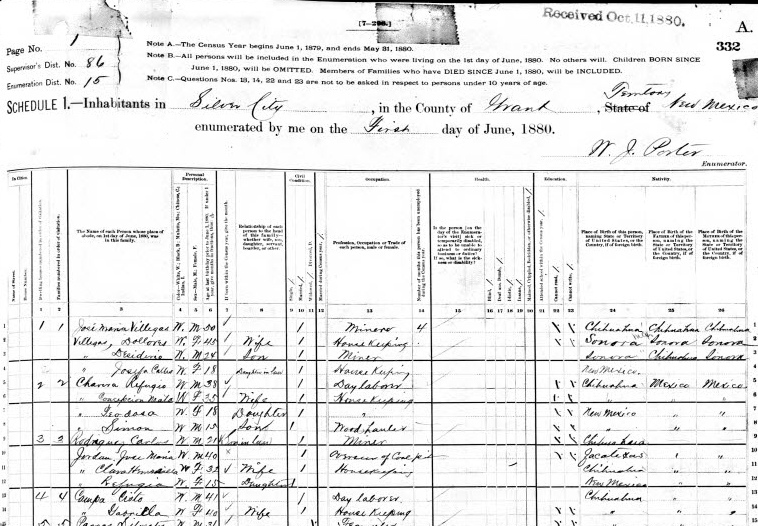 The family is listed together in the 1880 U.S. census in Silver City, New Mexico Territory, where Jose Maria’s profession was “overseer of a coal pit.” This would appear to denote a position of authority. This census mistakenly notes Jose Maria’s place of origin as Zacatecas, Mexico. It is unclear when they moved to Silver City, but the town was only founded in 1870 and was a tent city for much of the next decade. By 1880, according to the census records, the town’s population was approximately 1,800. Between 1880 and 1881 Jose Maria Clara, and Refugio moved again – this time 90 miles northwest from Silver City to Clifton, just over the border into Arizona Territory. This constant moving is consistent with early prospecting pioneer families in the “Old West” – always seeking the next big strike or new opportunity to strike a fortune. Jose Maria is listed in the Graham County, Arizona tax assessment rolls from 1881-1884. In each of the four years on these rolls, he declared and paid taxes on cattle, horses, mules, and wagons. Clara and Refugio are listed together in the 1882 Census of Graham County, Arizona living in Clifton, and there is a J.M. Jordan listed separately but also living in Clifton. There is also a Jose M. Jordan listed in the Great Register of Graham County who registered in October 1882. While still living in New Mexico, Jose Maria apparently began a freighting/transport operation that he brought with him to Clifton. Graham County Recorder’s records from January 1882 includes a transaction between Jose Maria and the Longfellow Copper Mining Company, whereby Jose Maria agreed to sell his four wagons, one ambulance, 26 mules, and one horse to Longfellow for the sum of $2150. The agreement notes that the property had constituted what was commonly called “Jordan’s Train” and were used in freighting between Clifton and Lordsburg, New Mexico. The transaction stipulates that the property could remain in the possession of Jose Maria as long as he continued in the employ of Longfellow and continued to freight at a previously established rate. Jose Maria must have been a man of some importance in the business and civic affairs of the young town. There are several court records from the November 1883 session of the Graham County District Court whereby he served as a trial juror on several cases. That he would be chosen to serve in such a capacity demonstrates his level of education and likely his strong command of English. Graham County District Court records also contain a case whereby Jose Maria is a plaintiff against his wife Clara. The case begins in June 1882 and runs through November 1883, whereby the judge orders and decrees that the marriage between Jose Maria and Clara be dissolved, resulting in divorce. We have not located any records pertaining to Jose Maria following the divorce, which could mean that he died shortly afterward or perhaps after separating from the family he established a life elsewhere. Clara remarried in 1890 in Clifton, where she remained until her death on November 17, 1905. She is buried inside the family plot at the Sacred Heart Cemetery in Clifton. Refugio, who according to oral tradition was also referred to often as Doña Cuca (a sign of respect), was born on February 23, 1865 in Las Cruces, New Mexico Territory, just a few months before the end of the U.S. Civil War. She is the first of our Jordan line to be born in the United States. She was baptized at St. Geneveive’s Church (built in 1859) on February 25, 1865 by Father Damaso Taladrid, and her godparents were Helino Contreras and Santos Calles. As noted above, Refugio is listed in the 1870 U.S. Census living in Las Cruces and the 1880 U.S. Census living in Silver City, New Mexico. 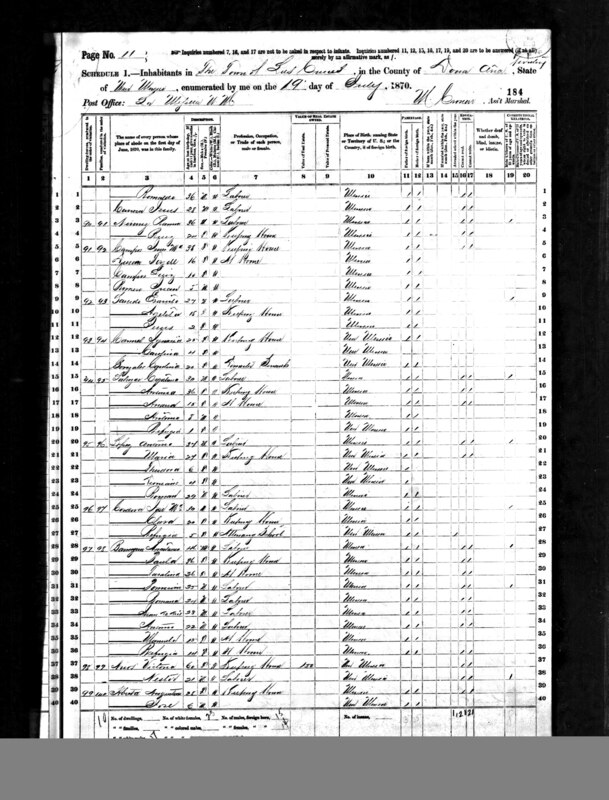 The 1870 Census notes that Refugio attended school. Refugio remained in Clifton for the remainder of her life. She is in all U.S. censuses between 1900 and 1940. When both her son Francisco and her daugther-in-law Anna separated, remarried, and left Clifton for good around 1914 and 1918 respectively, Refugio remained to care for her three grandchildren: Clara, Romulo, and Lucia. After 1920, both Clara and Lucia married and left Arizona permanently to live in California. Romulo remained in Clifton with Refugio until her death. She died on July 4, 1940 in Clifton of myocarditis and is buried in the Sacred Heart Cemetery. 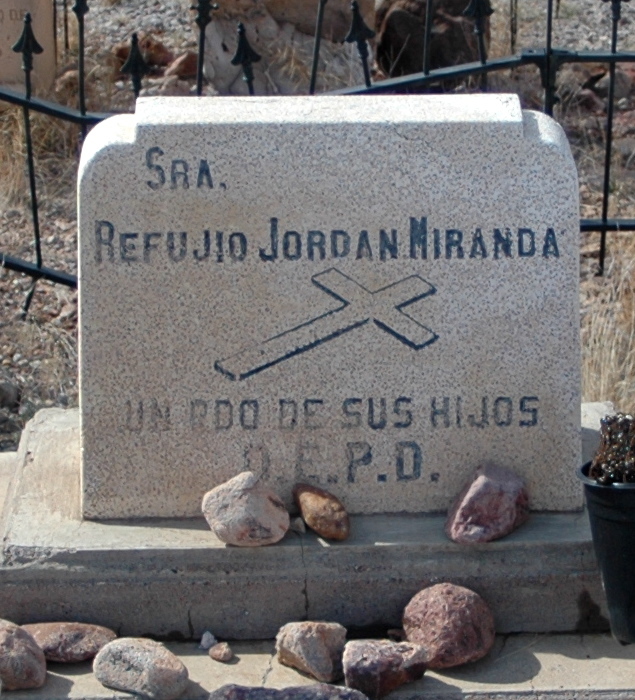 Her grave lies just outside the gated family plot and is labeled: Refugio Jordan Miranda – a gift from your children.